Paleographic results are almost always tentative, but frequently overstated by amateurs and professionals alike. For example, the Rylands Library Papyrus 𝔓52 was tentatively dated to the first half of the second century. Conservative scholars have continually pushed that date to the beginning of the century with little more reason than wanting it to be so. Paleographic dating is a judgment call, based on many different factors. Unfortunately, scholars don’t always realize when their faith clouds their judgment. 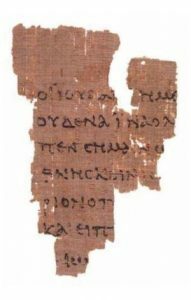 For example, several scholars dismissed Morton Smith’s letter from Mar Saba, which referred to a Secret Gospel of Mark, based in part on faulty and biased paleographic analysis. Using one papyrus to date another is often misleading, because scholars (either knowingly or not) compare them using the same circular reasoning — i.e., a manuscript of uncertain date is used to firm up the date of another manuscript of equally uncertain date. Once again, that pesky word rears its ugly head. We always need controls. What kinds of controls? Independent attestation, physical evidence, eyewitness accounts, and in this case, something “firmly dated” using a reliable method, rather than the comparison of scribal handwriting. Tim is an RV Park host who lives with his wife and six cats in a 20-year-old motor home. To read more about Tim, see our About page. Posted on 2019-02-22 22:09:14 GMT+0000 by Tim Widowfield. This entry was posted in Biblical Studies and tagged P52, Palaeography. Bookmark the permalink. Paleography – if I use Gothic font in a document that won’t mean I wrote it in the 14th century. The criticism of Detering referred to far later manuscripts on vellum, but it’s not exactly easy to check any of the claims, since neither the manuscripts themselves nor the analysis behind the dating is readily available online. That seems a bit hard to square with Detering’s suggestion that Anselm is the forget (died 1109). In principle, if Anselm were a forger, he might presumably use an ancient script for the purpose. So that’s not dispositive. Even so, one still needs evidence to conclude forgery; and I do find Detering, in this as in much of his work, all too often substituted speculation for evidence, and ran rampant with possibiliter fallacies (“possibly x, therefore x”). Which doesn’t discredit all his arguments and insights. It just means, much of them are unreliable; proposals at best, rather than conclusions, and it was wrong to paint the one as the other. On paleographic dating though, typical comparators (from which chronological script databases are built) are dated in the manuscript itself (i.e. the scribe actually says when it was written) or by in situ provenance (i.e. in what dig layer it’s found). Larry Hurtado has much to say on the point, e.g. here and here and indeed here, given that the latter references the rather brilliant revisionist work of Brent Nongbri (who wrote up an extensive treatise on the subject in God’s Library). One need merely compare Nongbri’s work with Detering’s to see the enormous difference between evidence-based revisionism and speculative revisionism being sold as fact. This is pretty much the whole difference people are keying on when they look side-eyed at Detering’s work and even perhaps suggest he was a crank. Detering’s work is galaxies apart from work like Nongbri’s. And in ways that do indeed border on the difference between professional and crank scholarship, at least close enough to make some people suspicious. I’m not invested in either conclusion. But I do understand why some people feel this way. Dr. Carrier, how pleasant and informative your words are about this topic. It seems, alas that the Bible attracts a lot of cranks and that any interpretation of the Bible that goes too far outside the scholarly mainstream is dismissed – rightly or wrongly – as crankery. Speaking of that, are you planning a re4sponse to the critique of your use of the story of Romulus to explain Christ mythicism? Dr. Carrier, I would be interested in your review of “O du lieber Augustin.” I have not found it yet.